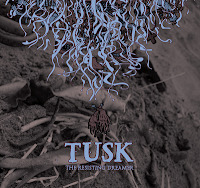 This is the latest CD from Tusk, which includes three members of Pelican (guitarist Trevor de Brauw, bassist Laurent Schroeder-Lebec and drummer Larry Herwig) along with new co-vocalists Evan Patterson (Breather Resist) and Toby Driver (Kayo Dot).The Resisting Dreamer finds Tusk moving away from the "avant-grind" of their last album into a little different, but still very unique territory. It's one of those albums that's hard to describe, a diverse and eclectic mix of genres that includes noise, doom, space rock, stoner metal and a few others. The music ranges from slow, simple dirges to fast, complex songs to unusual and experimental tracks that are sometimes noisy and dissonant, other times subdued and groovy.The album is one long song divided into 4 tracks, and the last one clocks in at 16 minutes and is all instrumental. The different genres, styles and moods described above are all packed into a relatively short album. The Resisting Dreamer is an avant-garde CD that is aggressive, complex, and always interesting.